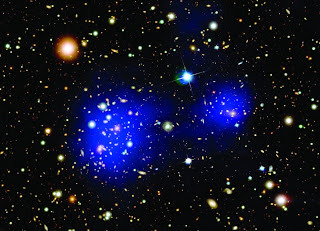 The universe abounds with dark matter. Nobody knows what it consists of. Astrophysicists have known for the last 80 years that most of the universe consists of an unknown, dark matter. The solution to the mystery may now be just around the corner. "We are looking for a new member of our particle zoo in order to explain dark matter. We know that it is a very exotic beast. And we have found a plausible explanation," reports Are Raklev, an associate professor in particle physics in the University of Oslo's Department of Physics. He is the university's leading theorist in astroparticle physics and has launched a model that explains what dark matter may consist of and how one can discover the invisible particles experimentally. "Even though we can calculate how much dark matter there is in the universe, we still know little about what dark matter is. The particles in dark matter must either have a lot of mass, or there must be very many of them. Neutrinos meet all the requirements of dark matter. But there is one big difficulty. They have far too little mass." "The gravitino is the hypothetical, supersymmetric partner of the hypothetical particle graviton, so it is also impossible to predict a more hypothetical particle than this," laughs Raklev, who writes on his web pages that he is looking for dark material both under his sofa and other places. 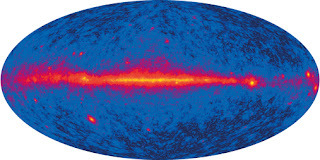 SIGNS OF DARK MATTER: The image shows all the gamma rays recorded by the Fermi-LAT space probe as a map of the entire universe. The red band through the middle of the image is radiation from our own galaxy. The centre of the galaxy is almost at the centre of the image. "It is here that a small surplus of gamma rays has been seen that one cannot immediately explain by the radiation one expects from ordinary matter. The observations may fit our dark matter models. This surplus of gamma rays is not visible to the eye, but can be found by a time consuming analysis of the data," says Are Raklev, who reminds us that the analysis is still a little uncertain. "A graviton is the particle we believe mediates gravitational force, just like a photon, the light particle, mediates electromagnetic force. While gravitons do not weigh anything at all, gravitinos may weigh a great deal. If nature is supersymmetric and gravitons exist, then gravitinos also exist. And vice versa. This is pure mathematics." "In order to unify gravitational force with the other three forces of nature we have to understand gravity as quantum theory. This means we need a theory in which the particle graviton is included in the atomic nucleus." Even though it has not been possible to observe dark matter, several billion neutrinos race through your body every second. However, their speed is somewhat limited. The particles move just as slowly as the speed the solar system moves around the galaxy. In other words, a mere 400 kilometres a second. "When there are no electromagnetic relationships with visible particles, the particles can pass right through us without any measuring instruments detecting them. This is where supersymmetry comes in. 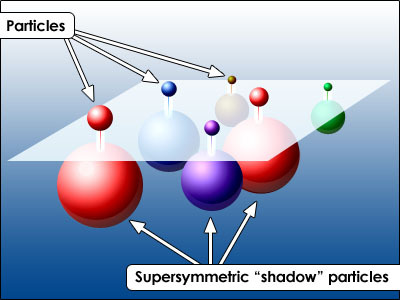 If supersymmetry is right, physicists can explain why there is dark matter in the universe. That is what is fun about my job," laughs Raklev. "Supersymmetry simplifies everything. If the ToE Theory exists, in other words if it is possible to unify the four forces of nature, gravitinos must exist." "A short time after the Big Bang we had a soup of particles that collided. Gluons, which are the force bearing particles in the strong nuclear force, collided with other gluons and emitted gravitinos. Many gravitinos were formed after the Big Bang, while the universe was still plasma. So we have an explanation of why gravitinos exist." "Physicists have therefore strived to eliminate gravitinos from their models. We, on the other hand, have found a new explanation that unifies the supersymmetry model with dark matter that consists of gravitinos. If dark matter is not stable, but just very long lived, it is possible to explain how dark matter consists of gravitinos." In the old models dark matter was always everlasting. This meant that gravitinos were a bothersome part of the supersymmetry model. In Raklev's new model, their life span is no longer endless. Nonetheless, the average life span of gravitinos is very long and actually longer than the life span of the universe. "We believe that almost all dark matter is gravitinos. The explanation lies in very hard mathematics. We are developing special models that calculate the consequences of these theories and we predict how the particles can be observed in experiments." "On the other hand, it should theoretically possible to observe them from a space probe." "At least it happens so rarely that we could never hope to observe it." "Luckily for us, gravitinos are not one hundred per cent stable. They are converted into something else at some point. We can predict what the signal looks like after gravitinos have been converted. The conversion will send out a small electromagnetic wave. This is also called a gamma ray." NASA's Fermi-LAT space probe is currently measuring gamma rays. A number of research groups are now analysing the data. "So far we have only seen noise. But one of the research groups claim they have observed a small, suspicious surplus of gamma rays from the centre of our galaxy. 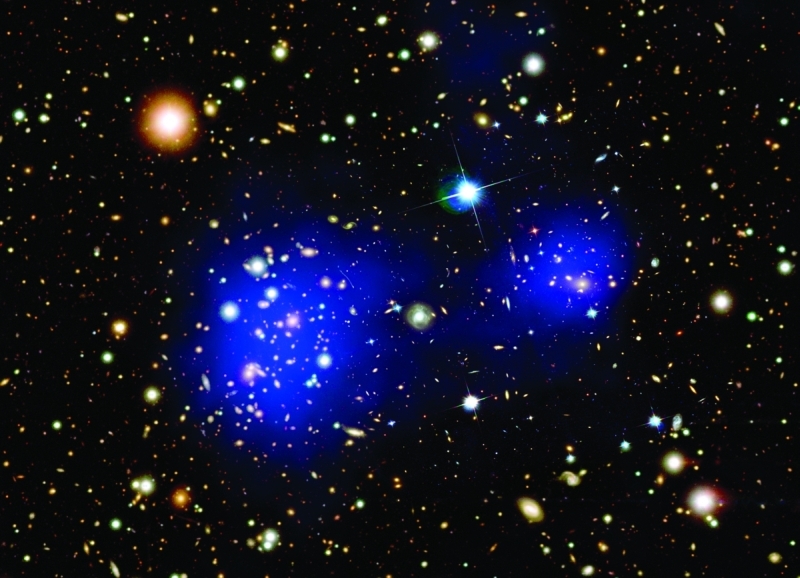 Their observations may fit our models," says the man behind the very difficult mathematical model for dark matter, associate professor in theoretical particle physics, Are Raklev.